Between 1932 and 1994, Democrats controlled the U.S. House of Representatives for 58 of 62 years. Since then, however, party control has changed three times, with Republicans controlling the House from 1995 through 2006, Democrats from 2007 through 2010, and Republicans since then. It seems clear that neither party has a lock on the House today. So the question now is, could Democrats take control back again in 2012? With 242 seats, Republicans now hold their largest majority in the House since after the 1946 elections. Still, the current GOP majority is considerably smaller than the majority Democrats held before the 2010 election. Democrats would only need to pick up 25 seats in 2012 to get to the magic number of 218 that would give them control of the House–assuming that all of their members supported the Democratic candidate for Speaker. That’s hardly an insurmountable number. In fact, two of the last three elections, 2006 and 2010, have produced bigger swings, and 2008 came close. Despite the recent volatility of House elections, some astute political observers are giving the Democrats little or no chance of regaining control of the House in 2012. For example, last December, Republican pollster Glen Bolger went so far as to “guarantee” that the GOP would maintain its House majority even if President Obama were to win a second term. And just last month, respected political handicapper Charlie Cook agreed that a Democratic pickup of 25 or more seats in the House was highly unlikely. Both Bolger and Cook cited the relatively short coattails that winning presidential incumbents have had in recent years as a major obstacle to big Democratic gains in the 2012 House elections. In the past 40 years, the largest number of House seats gained by the winning incumbent’s party was 16 in 1984, a year in which Ronald Reagan won reelection by a landslide. You have to go all the way back to 1964 to find an election in which the winning incumbent’s party gained at least 25 seats in the House. Notwithstanding these predictions and the historical record, however, there are three reasons to believe that Democrats have a decent chance of taking back control of the House in 2012. First, as a result of their big gains in 2010, Republicans will be defending a large number of seats in House districts that voted for Barack Obama in 2008; second, many of those districts are likely to vote for Obama again in 2012 because of the difference between the presidential and midterm electorate in the current era; and third, Republican incumbents in these Obama districts will be at high risk of losing their seats if Obama wins because straight-ticket voting is much more prevalent now than it was 30 or 40 years ago. Table 1 displays the 2008 presidential election results in the districts of current Democratic and Republican incumbents. The data in this table show that in the aftermath of the 2010 midterm election, there are 60 Republicans in districts that were carried by Barack Obama in 2008 including 15 in districts that Obama carried by at least 10 points. In contrast, there are only 12 Democrats in districts that were carried by John McCain in 2008 and only six in districts that McCain carried by at least 10 points. Of course before the 2012 congressional elections take place, House districts will be redrawn based on the results of the 2010 Census. In states where Republicans control redistricting–and the number of such states grew considerably as a result of the 2010 midterm elections–GOP legislatures may be able to redraw the lines to protect potentially vulnerable Republican incumbents. However, the ability of Republican legislatures to protect their party’s House incumbents may be limited by the dramatic increase in the past decade in the nonwhite share of the population in many states. For example, while Republicans will control redistricting in Texas, which is gaining four House seats, more than any other state, most of the population growth in Texas has been because of the rapid increase in the Hispanic population. At least one, if not two, of the new Texas House districts are likely to go to Hispanics. Another factor likely to favor Democrats in 2012 is the difference between the presidential and midterm electorates–a difference that is much more politically significant now than in the past. That is because Democrats now depend more than ever on the votes of young people and minorities, groups that make up a considerably larger share of the electorate in presidential elections than in midterm elections, while Republicans depend more than ever on the votes of older whites, a group that makes up a larger share of the electorate in midterm elections than in presidential elections. According the national exit polls, nonwhites made up 26% of the electorate in 2008 versus 23% in 2010. Voters under the age of 30 made up 18% of the electorate in 2008 versus 12% in 2010 while those 65 or older made up 16% of the electorate in 2008 versus 21% in 2010. In terms of race and age, the 2012 electorate is likely to look much more like the 2008 electorate than the 2010 electorate. In fact, because of the continued growth of the Hispanic population, the nonwhite share of the electorate is likely to be even larger in 2012 than in 2008. Perhaps the most important reason why Democrats could take back the House in 2012 is that party loyalties in the electorate are stronger than they were 30 or 40 years ago, and congressional elections are more nationalized. 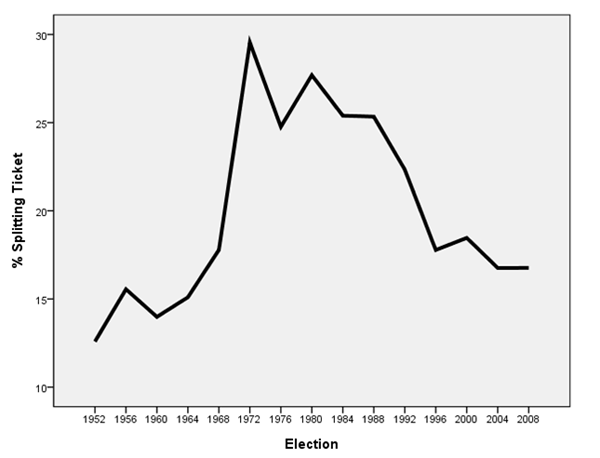 As a result, straight-ticket voting is now much more prevalent than it was in the 1970s and 1980s. Figure 1 displays the trend in ticket-splitting in presidential and House elections since the 1950s based on data from the American National Election Studies. The results show that ticket-splitting peaked between 1972 and 1988 and has declined considerably since then. Source: American National Election Studies. The rise of straight-ticket voting means that a party winning a decisive victory in the presidential election is now more likely to make substantial gains in the House of Representatives than it was during the 1970s and 1980s when ticket-splitting was more common. These results suggest that if Barack Obama defeats the Republican presidential candidate by a good margin in 2012, and of course that is far from certain, Democrats are likely to make substantial gains in the House elections. It is far too early to make any specific forecast of the outcome of the 2012 House elections. What we can say, at this point, is that if Barack Obama wins a decisive victory over his Republican challenger in the presidential election, Democrats have a realistic chance of regaining control of the House. That is because even after redistricting Republicans will be defending a large number of seats in districts that were carried by President Obama in 2008, the 2012 electorate is likely to look much more like the 2008 electorate than like the 2010 electorate and straight-ticket voting is now much more prevalent than it was 30 or 40 years ago.